As Rotarian Hendrik van Genderen handed over the cheque, he pointed to the worldwide reach of Rotary. 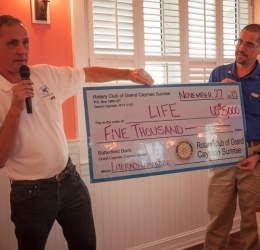 This donation comes from the Rotary Foundation through district 7020, of which the Cayman Islands is part. The district reviewed the application, van Genderen said, and agreed to this grant, which is an example of Rotary’s commitment to literacy and its confidence that LIFEwill use the funds wisely.